Nothing is more important to business success than communicating professionally and promptly with customers and colleagues. The way businesses communicate and handle incoming calls, and everything from faxes to conference calls, affects public perception of the company. Evolving businesses can better serve customers and enhance the way employees work by adopting the most readily available and affordable technology. 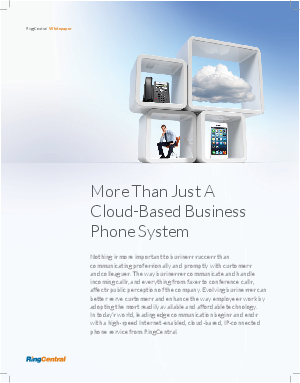 In today’s world, leading edge communication begins and ends with a high-speed Internet-enabled, cloud-based, IP-connected phone service from RingCentral.